There are three prominent symbols on the Australian flag. That includes the Union Flag used by the United Kingdom. This uses the three heraldic crosses representing the countries of the United Kingdom, including St. George’s Cross of England, St. Andrew’s Cross of Scotland, and St. Patrick’s Cross of Ireland. This was thought to have been added to symbolize the history of Australia as a British colony. The flag also features the Commonwealth Star, or Federation Star. This star has seven points representing the six federating colonies. Finally, the flag features the Southern Cross. This is a constellation that has been used to represent the nation since it was settled by the British. The flag of Australia features three colors: red, white and blue. The blue is featured as the field and is also a part of the Union Flag. 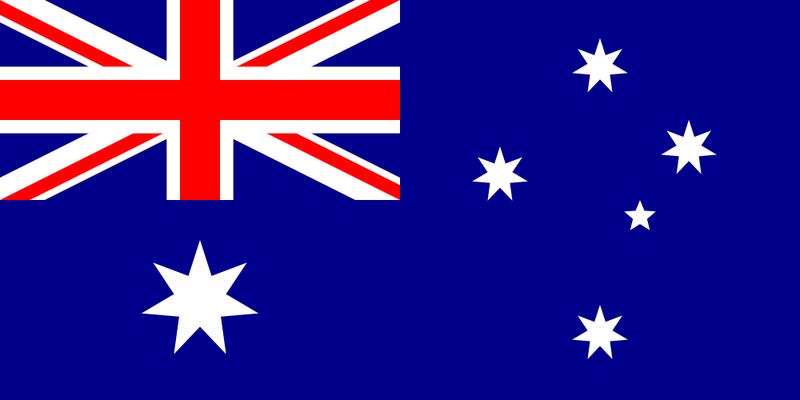 The red is used as part of the Union Flag, and the white is the final color of the Union Flag, as well as the color of the Commonwealth Star and the Southern Cross. During the 19th century, Australia was under the rule of the British, and the Union Flag was used beginning in 1770. It was also during the 19th century when flag movements were created and unofficial flags went into use. The most common of these flags was the Federation Flag used in 1831, which was designed by Captain John Nicholson. It was in during the 20th century when the seriousness of having a national flag set in. In 1900, a content was held to find a new design for the national flag. The requirements of the contest were that the Union Flag and the Southern Cross had to be used in the design. Another contest was held and over 32,000 entries were received. The two contests were merged and the designs were judged based on seven criteria, including loyalty, history and cost to manufacture. Five entries that were almost identical in design were chosen, and the winners split the prize money, which today would amount to about $25,000. The national flag flew for the first time in 1901. The flag was later revised in 1908 to change the Commonwealth Star from six points to seven. Since 1908, the flag has remained unchanged. The Flags Act outlines the exact specifications for the design of the Australian flag. The Flags Act also features guidelines for flying the flag. It is recommended to fly the flag only during daylight hours. If the flag is flown at night, it must be illuminated. It is also recommended to not fly two flags on the same flag pole. Australia has an email service that provides citizens with information on when to fly the flag. September 3 has been designated as Australia’s Flag Day.